Meanwhile, numerous institutions also in Germany have resumed dealing with the topic “Urban Health”. The project “Building bridges” selected institutions (by no means exhaustively) which deal with this topic in an interdisciplinary and cross-sectoral way. The “Yellow Pages for Urban Health” compactly present these protagonists with their activities in the area of urban development and health on the basis of publicly accessible information. In the current version, a focus is on the activities of the Research Program “Cities of the Future”. To complete and improve the presentation for the future, feedbacks and additional suggestions are welcome. The Department of Urban Planning and Regional Development held the conference “City of the Future: Green and healthy? Sustainable and health-promoting development of urban areas in the 21st century”. Among other activities, the coordination of the Junior Research Group Salus is hosted by the School of Spatial Planning. In addition, this department is involved, for example, in academic field trips and the development of the “Fachplan Gesundheit” (Local health plan). The Junior Research Group StadtLandschaft & Gesundheit is hosted by the Faculty of Health Sciences – Bielefeld School of Public Health. 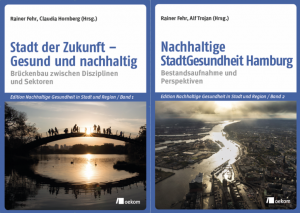 Involvement in academic field trips, the development of the “Fachplan Gesundheit”(Local health plan) and “Leitfaden Gesunde Stadt” (Healthy city guideline). The conference „Health-promoting Urban Landscapes of the Future “ was organized here in 2014. The Institute for Public Health and Nursing Research is conducting research on urban health and environmental justice at the interface between social and environmental epidemiology. In projects such as the Junior Research Group Salus and AFOOT, approaches to a health-promoting urban development are being pursued. The Center for Urban Epidemiology explores the links between urban systems and health opportunities / risks. The profile area “Urban Systems” conducts applied research on metropolises. Activities of the Institute of Sport Science include hosting the Junior Research Group AutonomMobil. Organization of the conference in Bolzano „Stadt der Zukunft: gruen, gesund, lebenswert“ (City of the future: green, healthy, and livable) in 2012. Since 2013 working group “Planning for health-promoting urban development”, including position paper (2014). Since 1999, federal-state program “City Districts with Special Development Needs – The Socially Integrative City”. Coordinates the nationwide cooperation network “Equity in Health”, which includes 60 organizations with a focus on “health promotion in the city district”. Projects: „European Urban Health Indicators System“, “Movement and Health-promoting Community”; initiator of the “Fachplan Gesundheit” (Local health plan) and “Leitfaden Gesunde Stadt” (Healthy city guideline). Promotes sustainable development in the sense of Agenda 21 (1992). Multiple developments and projects, including the National Environmental Health Action Plan (NEHAP), Local Agenda 21 – Environment and Health, and Environmental Justice developments (e.g. in urban areas). Coordination of the working group “Health Promoting Local and Urban Development” (since 2002); Project topics include adaptation to climate change (KommAKlima) and Environmental Justice. Expertise for health implications of physical environmental factors; since 2014 Committee “Urban Health”. Expertise on environmental impact assessment; since 2008 working group “Human Health”, including guidelines ” Human Health as the subject of protection” (2014). Since 2011: research program “Cities of the Future – healthy, sustainable metropolises” including Junior Research Groups, conferences and the project „Building bridges across disciplines and sectors”. Since 2003, in cooperation with the Federal Centre for Health Education: Coordination of Cooperation Network “Equity in Health” to support health promotion for socially disadvantaged groups; projects for community health promotion in the city state of Berlin and the surrounding area. Projects for community health promotion in the city state of Hamburg.